John Robert Turner Musgrove is my 1st cousin 1x removed. His parents are John Robert Musgrove and Phoebe Scott. Our common ancestors are Joseph Musgrove and Elizabeth Ann Turner, my great grandparents. John (Jack) was born on 17 July 1916 in Clitheroe, Lancashire. In the 1939 Register John’s occupation is listed as “carpenter’s labourer”. He was living at home with his parents. On the 17 June 1943 John married Jean James in Axbridge, Somerset. Details of the wedding were published in the Clitheroe Advertiser and Times on 25 June 1943. Private Jack Musgrove, King’s Own Royal Regiment, eldest son of Mr and Mrs J Musgrove, 32 Hayhurst Street, Clitheroe, was married yesterday week, at St John’s Church, Axbridge, to Miss Jean James, youngest daughter of Mr and Mrs P James, 17 Parkfield, Axbridge, Somerset. The bride, who was given away by her father, wore a white satin dress designed on Tudor lines, with an embroidered veil and wreath of orange-blossom. She carried a bouquet of red roses. Miss Nancy James, the bride’s sister, was the bridesmaid, and her dress was in floral satin, with lace head-dress to tone. Her bouquet was composed of blue cynthias. Mr Joseph Musgrove, brother of the groom, undertook the duties of best man, whilst those of groomsman were carried out by Mr Joseph Waterhouse, brother-in-law of the bridegroom. A pendant was the bridegroom’s gift to the bride, and he received from her a wrist watch. He gave a cheque to the bridesmaid. After the reception, which was held at the home of the bride, the newly-married pair travelled to Mr Musgrove’s home town for the honeymoon, the bride wearing a floral gown, with a grey coat and hat to match. Amongst the many presents were a canteen of cutlery and silk bedspread from work friends of the bride. Previous to joining the Forces, three and and a half years ago, Mr Musgrove was employed at Whiteacre Camp, Barrow, and he was very well known in the district as a trumpet player, having been associated with the Borough Band and local dance bands. After the end of the war John and Jean lived in Somerset and had three children. Elizabeth Ann Turner is my great grandmother – she was born on 31 May 1873 in Kendal, Westmorland. Her parents are Thomas Turner and Mary Jane Carradice. Libby Ann married Joseph Musgrove on 12 April 1893 at the Register Office in Settle, Yorkshire. After Joseph died in 1933 Libby Ann married Albert James Whiting on 22 Jun 1935 at the Register Office in Clitheroe, Lancashire. On the 29 November 1946 Libby Ann passed away and was buried in Clitheroe Cemetery four days later. 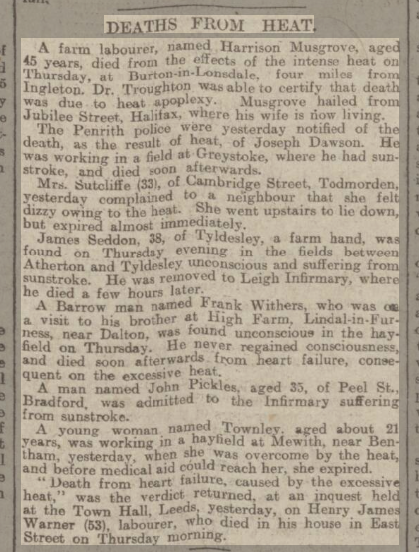 Details of her death were published in the Clitheroe Advertiser and Times on 6 December 1946. The death occurred last Friday of Mrs Elizabeth Ann Whiting, aged 73, wife of Mr James Whiting, of 13 Whalley Road, Clitheroe. Mrs Whiting was particularly well known throughout the country districts as far as Settle, but having been twice married, was better known as Mrs Musgrove. She had travelled the district with drapery. She leaves eight daughters and eight great-grand-children. The interment at St Mary’s Cemetery on Tuesday was conducted by the Rev H Y Burnett. John Robert Turner Musgrove is my grand uncle – in other words my grandmother’s brother. His parents are Joseph Musgrove and Elizabeth Ann Turner, my great grandparents. John was born on 2 November 1891 in Giggleswick, Yorkshire. He was baptised almost two years later on 5 October 1893 at Horton in Ribblesdale, Yorkshire. He was the oldest of at least ten children. By the time of the 1901 census the family had moved south to Lancashire and were living in Clitheroe. When the next census was taken in 1911 John was working as a “bleacher” in a calico cloth print works. When the 1939 Register was taken John’s occupation is given as “shoe repairer”. The family were living at 32 Hayhurst Street, Clitheroe. John died on 27 February 1944 and his death was reported in the Clitheroe Advertiser and Times on 3 March 1944. The death occurred on Sunday of Mr John Robert Turner Musgrove, 32 Hayhurst Street, Clitheroe, at the age of 52. A native of Giggleswick Mr Musgrove came to Clitheroe when in his teens, and for some time he was employed at Barrow Printworks. Later, he began business as a clogger in Shaw Bridge and in recent years he had worked in the quarry. Mr Musgrove, who was wounded in the last war, was a member of the British Legion. Another brother, Thomas, made the supreme sacrifice, whilst a younger brother is serving now. Mr Musgrove’s two sons are both in the Forces. Sincere sympathy will be given to his wife, sons and daughter in their bereavement. Mr Musgrove was associated with the Moor Lane Methodist Church, whose minister, the Rev J E Storey, officiated at the interment, yesterday, at St Mary’s Cemetery. 1870 … Mary Buckley (Heaps) died in Keighley, West Yorkshire. She is the wife of my 2nd great grand uncle. 1935 … Elizabeth Ann Musgrove (Turner) married Albert Whiting at the Register Officer in Clitheroe, Lancashire. Elizabeth is my great grandmother.